If you are collecting information on how to grow your own vegetable garden, keep in mind that most of the vegetables are quite exigent when it comes to sun and moisture. The sunniest place in your backyard is the most appropriate spot to stake out your plot as most veggies require a minimum of 6 hours of sunlight per day. Besides, they are moisture-addicts so it’s better to grow them near a water source. Also, there is an endless battle with the weeds – the undesired company of the vegetables. 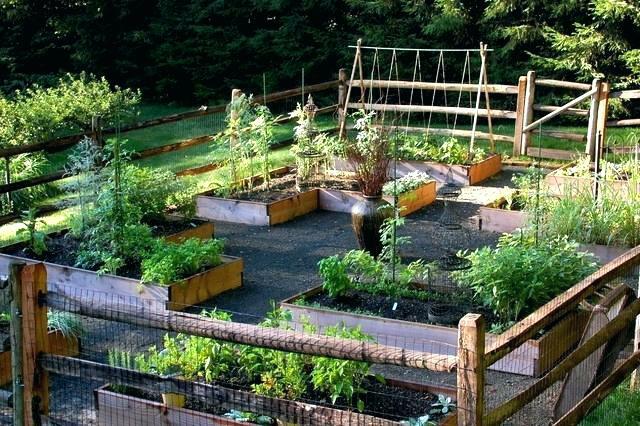 In this article, you will find 20 great solutions on how to grow a DIY vegetable garden. Get inspired and go out planting! I decided to start with the DIY raised vegetable garden bed, made out of wood, that look both appealing and yield up to 4 times more than the same amount of space planted in rows. Just make sure you use naturally rich soil that would boost the growth of healthy veggies. 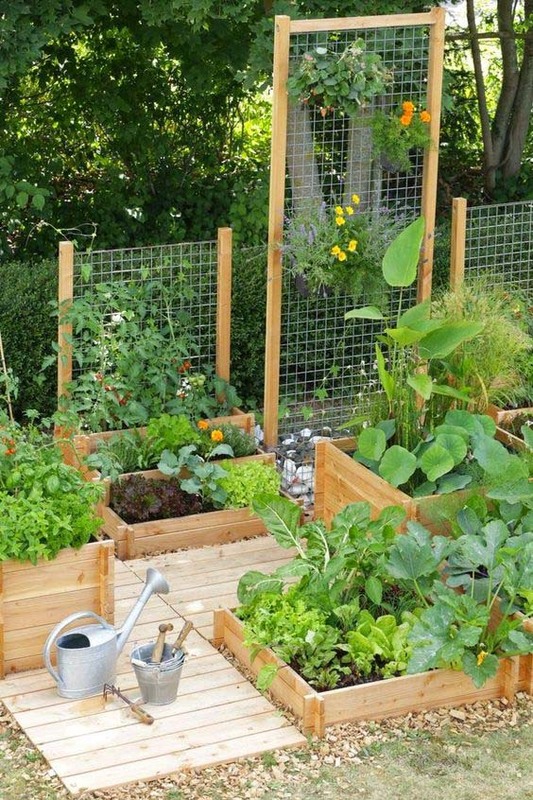 Even if your yard is not too spacious, you can simply differentiate your DIY vegetable garden by building a low fencing of wood and wire. 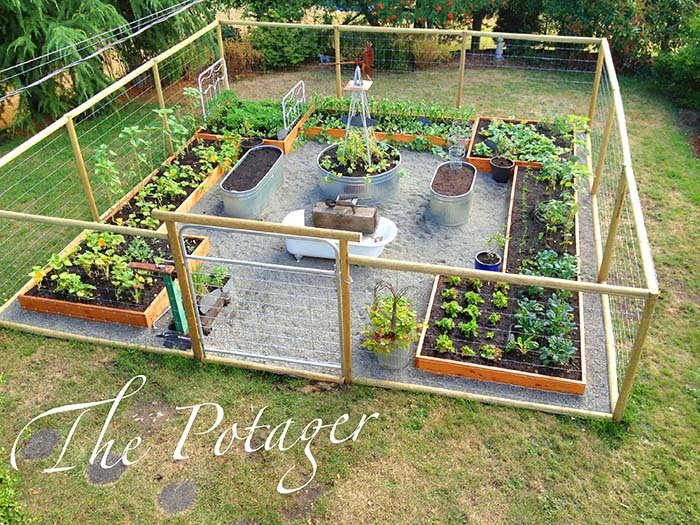 Here is an amazing idea on how to grow a small vegetable garden and having a spot to relax in the same time. It is detached from the rest of the yard with metal 6 ft deer fencing. Moreover, it this veggie garden has some cute rustic vintage accents such as the old cast iron claw foot bathtub, an old cast iron bed frame and more. 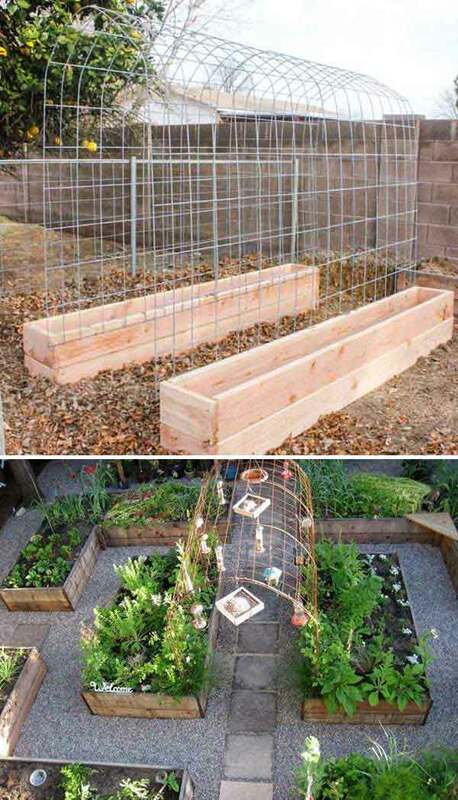 This DIY raised vegetable garden is a fun combination of trellis and raised wooden garden boxes. The unusual structure will surely turn into the focal point of the yard. 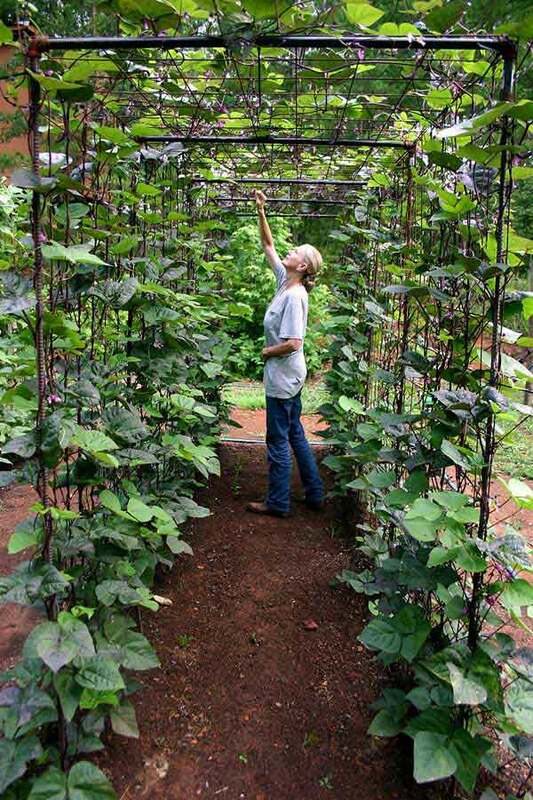 This DIY vertical vegetable garden is a real space-saver when you are growing green beans. Lots of gardeners are calling these cone-shaped tents living teepees and they can be such fun for your kids. One of my most favourite DIY garden projects is this herb garden in a cobblestones piral – ideal for those of you with limited yard space. You can also use empty glass bottles, jars in various sizes as well as bricks. Add this project to your list of ideas for irregular shaped yards! 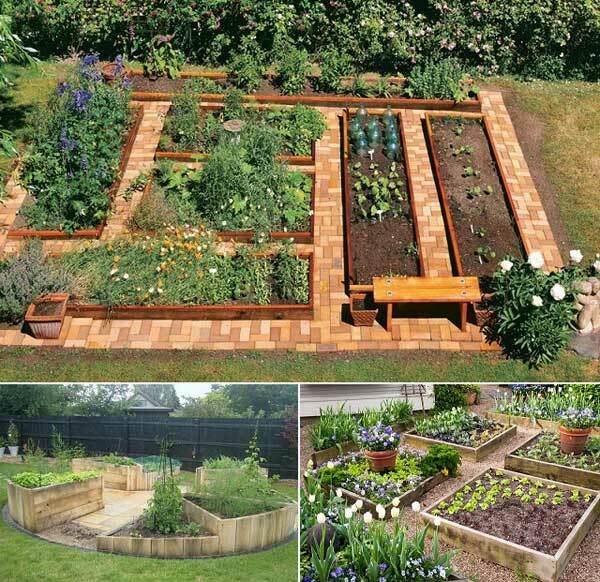 A set of raised beds was created from reused cobblestones. Thanks to the cute, narrow gravel paths, the maintenance and access to the beds is a piece of cake. Even though the initial cost of constructing your own garden with vegetables can be high, we should be all be willing to pay it for the benefits of growing your own healthy veggies. 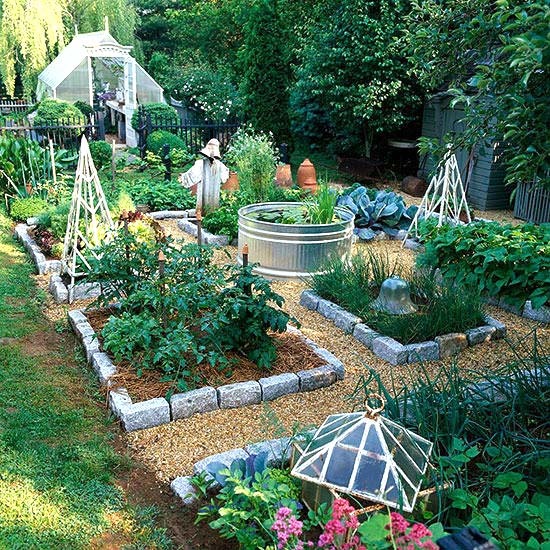 When creating vegetable beds, make them wide enough so that you can still have a layered garden that will provide extra colors, textures, and edge softening mantle. 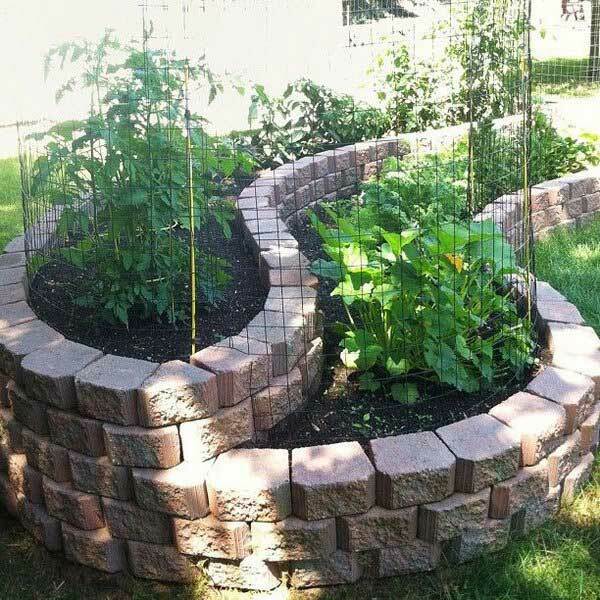 This idea is similar to creating a brick flower bed. With a bit of creativity, you can set up a combination of vegetables and some colorful potted perennial plants that would help you define an entire garden area. 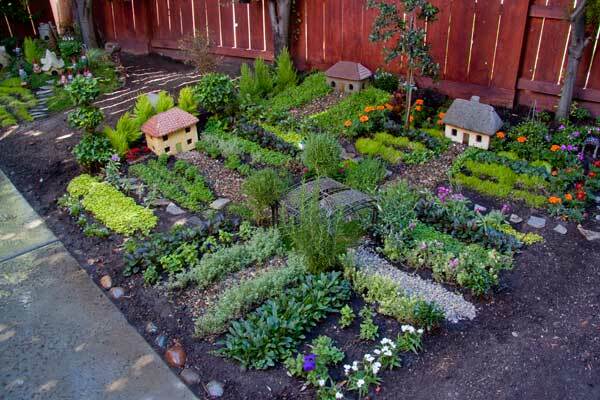 Play with the heights and the colors to make a visually appealing, partly raised garden. These pathway gardens provide architecture and convenience to these small gardens full with vegetables. 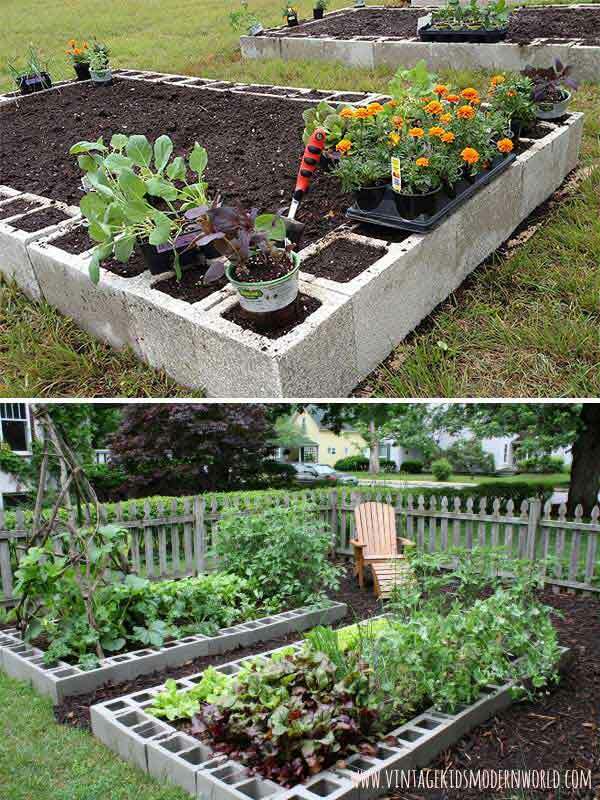 Another idea – build a raised garden bed from cement bricks that fuse flawlessly into the backyard. 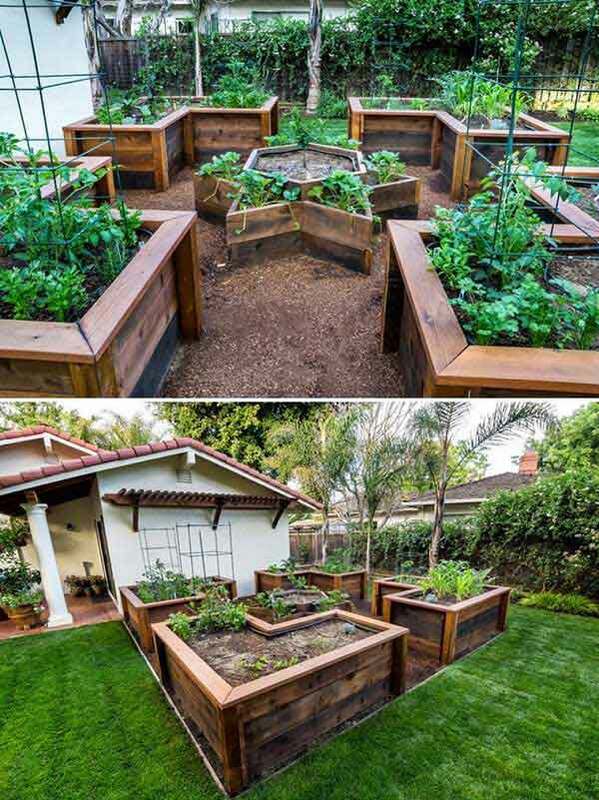 Using regular tools and a diamond-grit circular saw knife you can construct these twin raised bed in 2-3 days. You can easily grow vining tomatoes, cucumbers, squash, gourds, peas, and pole beans. 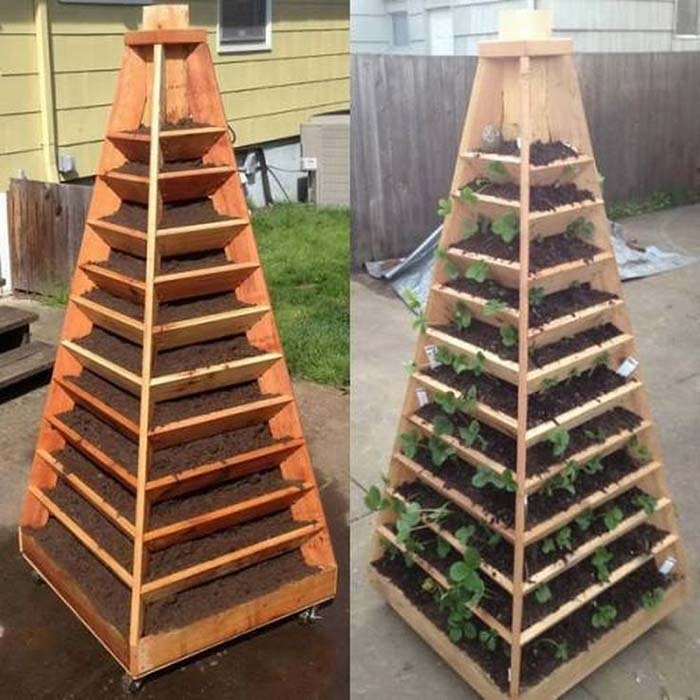 In case you have a glide in your backyard, why don’t you recreate this stair-cased wooden pallet planter project to adorn your fresh food supplying garden? Hint: Do not paint the stair-cased pallet planter as the organic wooden color will give it a simple, unpretentious look. 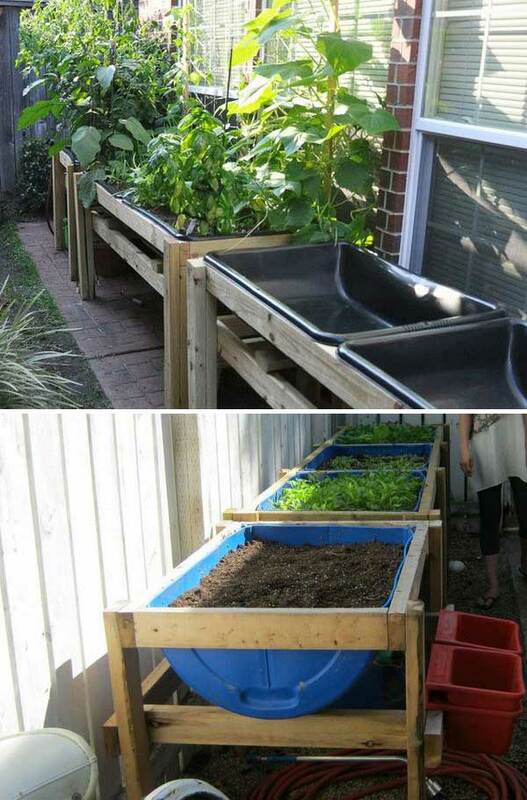 Here is an excellent example of how you don’t need a spacious yard (or even much of a yard at all) to grow your own vegetables in a DIY raised garden. It’s easy for watering and harvesting, your only concern will be the amount of sunlight your vegetable get on a daily basis because it is too close to the building walls. 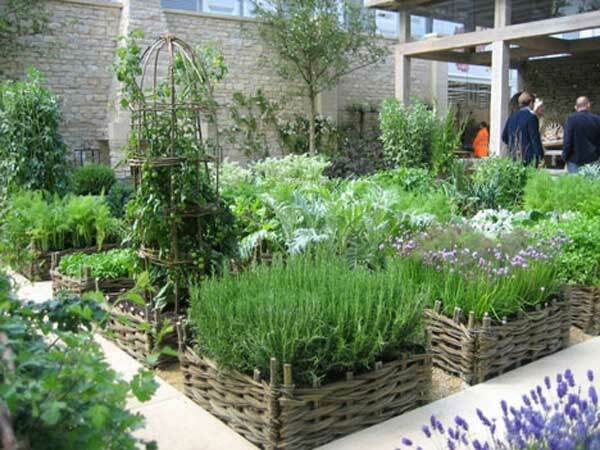 You will be stunned by the astonishing quantity of vegetables that can be grown in a one square meter pallet garden! 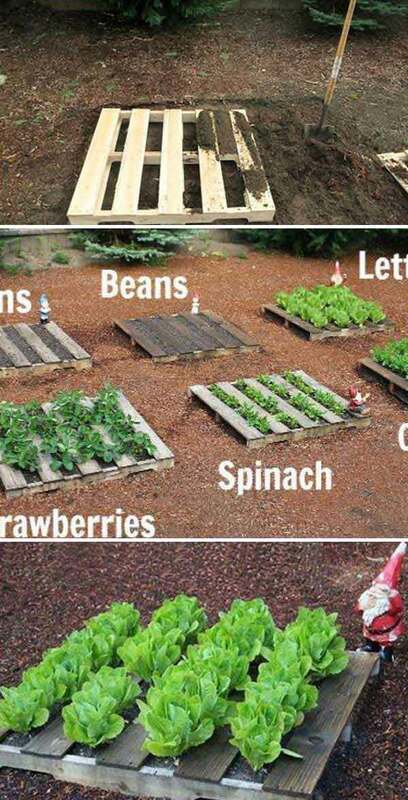 Another great idea of pallet use. You can plant spinach, beans, lettuce and strawberries or other shallow rooted herbs and vegetables. Planting seasonally can be a great option to use the weather as a gardening asset to help you ease the workload. Give your vegetable spot a little twist by planting some colorful seasonal florals and displaying some fairy elements such as decorative houses and ponds. The rustically chic wooden constructions, used as vegetable beds, give this yard a farmhouse vibe and helps warm the soil in the spring. Keep in mind that, depends on the plants you grow, the beds may need a bit of extra water during the hottest days of summer. 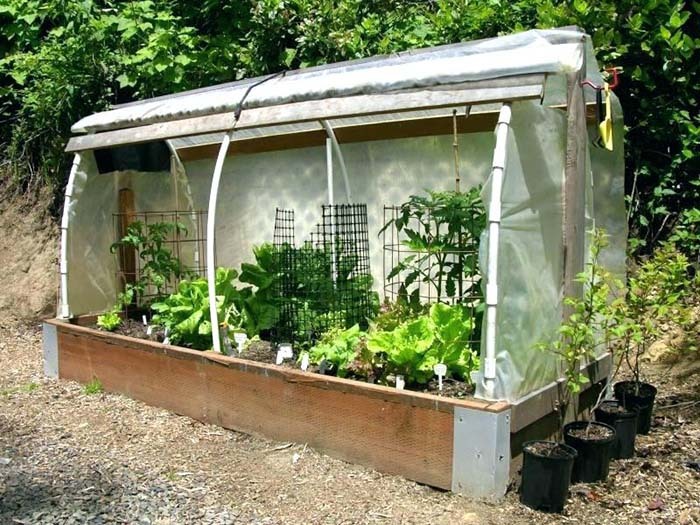 In case you want to have a multi-season garden for vegetables, consider building a hoop house right on top of a raised bed. In this way, your garden will be able to survive during the winter frost and get enough sunlight during the warm months of the year. The biggest advantage of this strawberry planter (that could also be a herb garden) is its space-saving trait. Moreover, it can be easily moved around the yard thanks to the small wheels. 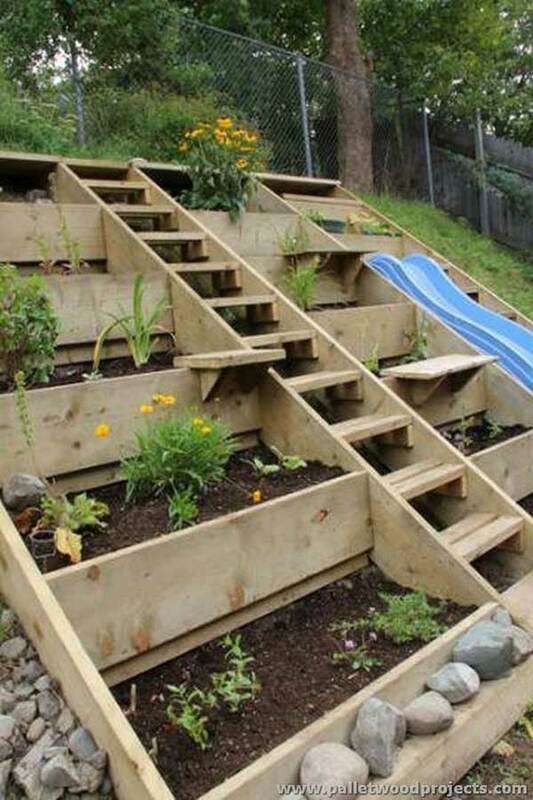 A real gem for every gardener! Recently, the whole world has experienced a rapid increase in the cost of vegetables. Moreover, they are usually full of pesticides and taste like plastic.